Premium Kitchens offer the finest luxury kitchen designs in Boca Raton, FL. Our team of designers will design the perfect custom kitchen for your home. Where To Look Online For Kitchen Design Ideas We all search for the best ways to go about fixing up the house. People search for the hot trends that fit the setting of their kitchen, the heart and soul of the entire home. Being that is 2017 going on 2018, home decorators are looking to keep their kitchen up to date without breaking the entire bank. There are several ways to go online for these design ideas that can fit the idea in mind. It is a matter of how the homeowner wants to move forward with the design process. IKEA Let’s just get these guys out here first way because they are in everything for the house and has extended their knowledge to people looking online. 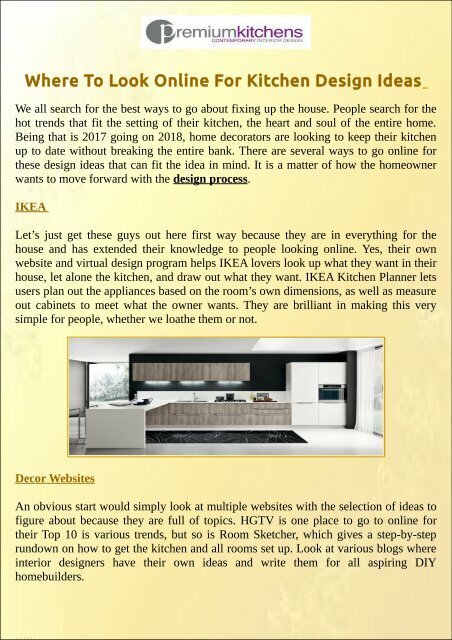 Yes, their own website and virtual design program helps IKEA lovers look up what they want in their house, let alone the kitchen, and draw out what they want. IKEA Kitchen Planner lets users plan out the appliances based on the room’s own dimensions, as well as measure out cabinets to meet what the owner wants. They are brilliant in making this very simple for people, whether we loathe them or not. Decor Websites An obvious start would simply look at multiple websites with the selection of ideas to figure about because they are full of topics. HGTV is one place to go to online for their Top 10 is various trends, but so is Room Sketcher, which gives a step-by-step rundown on how to get the kitchen and all rooms set up. Look at various blogs where interior designers have their own ideas and write them for all aspiring DIY homebuilders.